WEST WINDSOR – Mercer County Community College (MCCC) English Professor Jack Tabor will deliver a lecture on the impact of photography on the Holocaust as an historical event during a lecture at Mercer at noon on Wednesday, Oct. 22. Tabor's lecture, "On Photography and the Holocaust," is part of MCCC’s Distinguished Lecture Series and will be held in Room 109 of the Communications Building on the college’s West Windsor Campus, 1200 Old Trenton Road. The lecture is free and open to the public. The lecture is hosted by MCCC History Professor Craig Coenen who, with Tabor, led a Study Abroad tour to Poland in 2013 that included visits to the Auschwitz and Birkenau concentration camps, the Treblinka killing center, and the Warsaw Ghetto. "Visiting these places was our daily work," Tabor said. "When you approach the real thing, the undeniable reality of the Holocaust, that moment of understanding is a profound experience." During his lecture, Tabor will explore the relationship between the photographic image as cultural artifact, and the Holocaust as an historical event. His talk will examine the ways photography serves the ability to understand, and to some extent bear witness, to the plight of the millions who perished at the hands of the Nazis. 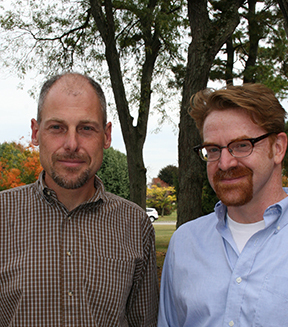 MCCC Professor Jack Tabor (right) will deliver the lecture "On Photography and the Holocaust" hosted by Professor Craig Coenen (left), who will give an overview of the upcoming Holocaust Study Abroad trip to Poland. As part of the presentation, Coenen will also discuss Mercer's May 2015 Holocaust Study Abroad program to Poland. The nine-day educational experience is open to college students and interested community members. For more information on MCCC’s Distinguished Lecture Series, call (609) 570-3324 or visit www.mccc.edu/events. For more information on MCCC's Study Abroad program, visit www.mccc.edu/studyabroad.